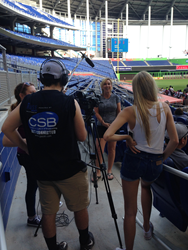 Connecticut School of Broadcasting students and graduates from their Palm Beach and Miami Campuses, got the thrill of a lifetime capturing the skills of future Major League baseball stars at Marlins Park. It is a great opportunity for our students and grads to utilize the hands on training they received at CSB and get in (and literally on) the field training. Officials at International Power Showcase say that approximately 39% of the athletes participating, go on to play baseball professionally and 100% will go on to play College Baseball. This experience also helps the stats for Connecticut School of Broadcasting Students looking to score a career both behind and in front of the camera. Almost every student/grad worked 3 or 4 positions and some came back multiple days so they could do it all. The Connecticut School of Broadcasting is the Nation’s largest group of Broadcast Media Schools with campus locations in CT, MA, NJ, NY, NC, GA and FL. If you’re looking for a career in Broadcasting, Call 1-800-TV-Radio or log on to http://www.gocsb.com.